Keerti Cargo is specialized in handling all type of chemical shipment, we are providing service for All type of Hazardous & Non Hazardous chemicals worldwide. Provided by us are exclusive services for Shipping Hazardous Material And Dangerous Goods to the customers. All types of hazardous & non-hazardous chemicals worldwide. We make sure that the services are timely executed by us in a timely manner. Some items may endanger the safety of an aircraft or persons on board it. The air transportation of these dangerous materials can either be forbidden or restricted. We offer Goods Handling Services, for clients from various industries. 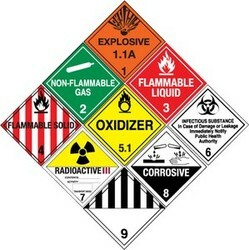 The most Dangerous and hazardous goods are handled easily with care by us. Our experienced team makes sure that these items are transported safely and delivered properly to the desired destination. We maintain a strict qualitative approach as these hazardous items are regulated under maritime standards. We at Unique Air Freight Express have deep knowledge in handling cold chain packaging and handling. We provide Gel Pack, Dry Ice service as well as offer special and custom packing, kitting services to our customer. Unique Air Freight Express And Logistics Pvt. Ltd.
Shoolin Shipping Services provide service for explosives and dangerous good’s to many parts of the world. With the rapid changes in aspects of security worldwide, Dangerous Goods consignments acquire a much more important approach. We have more than the required staff trained in Dangerous Goods Regulations Courses as laid down by IATA. Besides, a constant check enables us to ensure that such staff undergo Refresher courses every two years, in accordance with IATA regisration. We have a specialized team for handling the DGR cargo for both import and export. • Customs Clearance by Air. • Freight Forwarding by Air.